A nice fragrance and a fantastic price. I recently tried it and was pleasantly surprised. I always passed on it in the past because it was always on counters readily available. I guess I assumed it was inferior subconsciously? Thankfully I gave it a shot and really like it. Glad to see a new review on your blog. I've always put this to the bottom of my 'to-buy' list as I wasn't sure how close it was to Cuba Red which I already own. Is this different enough to warrant owning both? 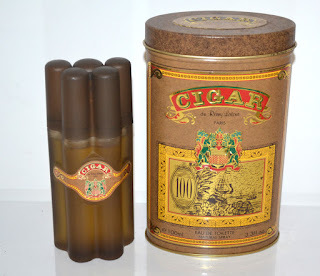 Cuba Red and Cigar are similar, but not identical. Cuba Red is spicier than Cigar, whereas Cigar is smoother. Cigar smells a lot like Krizia's Moods Uomo. I own both, and I don't regret it. Not essential, though. I bought this because you had mentioned it a few years earlier here on your blog. Since then I have bought lots of other scents,but this has become my personal Number One. I don't use it very often,either and each time I do it just blows me away. I agree the scent is awesome. However, the reason I didn't give this a higher rating is simply because there's almost no development over time. The scent smells exactly the same from the minute you put it on, through the next 12 hours, and it sometimes gets a little tiresome to smell. That's why I don't wear it more often. Thanks Shamu - I love Krizia Moods Uomo but only have a small sample bottle and have never been able to track down a full one. Knowing that this is similar (and much less expensive!) I may get this instead. I've always thought that Moods Uomo had that 'damp' aspect you mention in respect of tobacco frags. Santa Maria Novella Acqua di Cuba has it too from memory. @Derbyman-Lots of Moods Uomo bottles available on "that auction site"! Got one myself (aftershave) and love it. I'm a fan of both Cigar and Moods and your observation about the dampness aspect is spot on. Karen Low's Cut Cigar is another cheapie that does the same thing, but might be even more lifelike and "wet." It smells like tobacco leaves coated with morning dew. Hm, I've never heard of Cigar Cut. Sounds like my kind of tobacco frag. Where can I find it online? Try www.okperfumes.com. I paid $10 for a bottle a couple of years ago in Las Vegas. There's a bottle on ebay now for $43, but that's overpriced. Remy Latour out out a couple of new scents which supposedly smell like Tobacco Vanille, and i think one from By Kilian, though not sure. One is Cigar Black Wood. Other night be Black Wood? I humbly request Shamu to review black oud too.